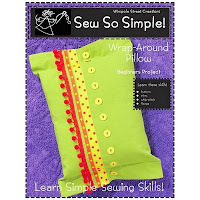 See our new learn to sew kits in the Sew It Kits section of the store. Sew So Simple! sewing kits from Wimpole Street Creations teach basic sewing skills. The brightly colored projects in this series are ideal for teaching children and teens how to sew. The Wrap Around Pillow Learn to Sew Kit is a beginner sewing project for you to make this decorative pillow for your room. Kit includes a solid twill dishtowel, coordinating trims, buttons, embroidery floss, needle, and step-by-step instructions. This easy sew kit teaches these basic sewing skills: buttons, trims, whip-stitch, and flange. You'll need to supply matching thread and a 14" square pillow form. 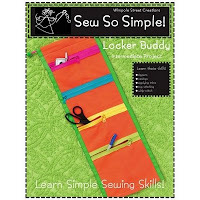 The Locker Buddy Learn to Sew Kit is an intermediate level sewing project. Create this handy locker organizer to use at home or school. Kit includes a solid twill dishtowel, decorative zippers, contrasting ribbon, wooden dowel, and step-by-step instructions. Learning to sew is a building block process. Start with beginner sewing projects to build confidence and soon you'll be ready to progress to more challenging projects. Kits make it easy for beginners to learn to sew! Weekend Kits carries the basic sewing supplies you need to get started, including Mundial sewing scissors, Dritz sewing pins, Mettler all-purpose thread, and more! You'll find them in the Sewing Supplies section of the store. Visit the Sew It Kits section to see more learn to sew kits from the Sew So Simple! series and be ready to start sewing on your next Weekend at Home! 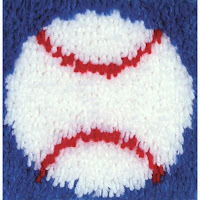 See our new selection of kits in the Latch Hook Kits section of the store! The Krafty Kids Latch Hook Kits from Caron International include everything a child needs to get started latch hooking! 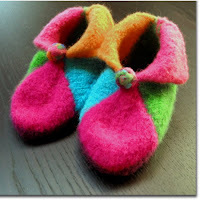 They come complete with color-coded canvas, pre-cut rug yarn, and easy instructions. These kits were designed with kids in mind! The rug canvas uses a larger weave to make hooking easier. Caron latch hook kits use color coded canvas. No charts required! You simply use the yarn color that corresponds with the pre-printed color on the canvas. 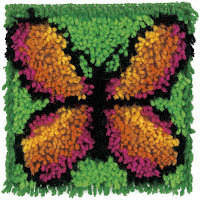 Krafty Kids rug kits are an ideal first latch hook project for beginners. The smaller size makes them easy to start and easy to finish! A latch hook tool is included, so there's no need to buy anything extra. 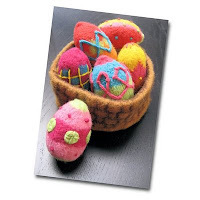 Complete latch hook craft kits make great birthday presents for children and grandchildren! 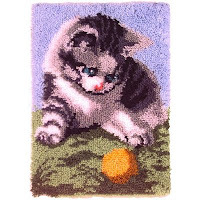 The Playful Kitten Latch Hook Kit is from Caron's Natura line of rug kits. Natura latch hook kits are perfect for adults and older children with latch hooking experience. These kits include color-coded canvas, pre-cut rug yarn, and instructions. 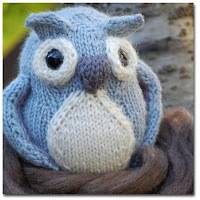 You'll need to supply your own latch hook tool for this kit. Latching hooking is easy and relaxing. It's a great activity to have on hand while watching your favorite television show. Getting started is relatively inexpensive, with smaller kits going for under $10! Your completed rug can be turned into a soft pillow or decorative wallhanging. Visit the Latch Hook Kits section for details on these kits and more. We'll be adding new latch hook kits soon, so be sure to check back for new additions! Weekend Kits offers beginner kits across a variety of crafting categories. Visit today to explore new creative project ideas for the entire family. Learning to create beautifully coordinated scrapbook pages is easy with the Leaves All In One Scrapbooking Kit from Creating Keepsakes. Choose from three designer options, including Batik, Leaves, and Paisley. You'll find them all in the Scrapbook Kits section of the store. If you're new to scrapbooking, you may be wondering how to get started. Just figuring out all of the pieces you need to pull together can be a challenge for beginners. I suggest starting off with the basics and then building on from there as you become comfortable creating your own scrapbook pages. There are 3 Basic Elements to getting started - Materials, Tools, and Instructions. 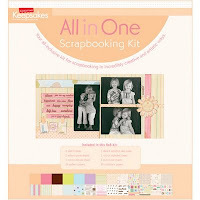 The Batik All In One Scrapbooking Kit takes the guess work out of selecting the materials you need to create your first 8x8 scrapbook pages. 8x8 simply refers to the dimensions, in inches, of your completed pages. This kit comes with a full selection of cardstock papers, patterned papers, rub-on sheets, punch-out sheets, and vellum quote sheets. No need to worry or wonder if colors and/or patterns work well together. 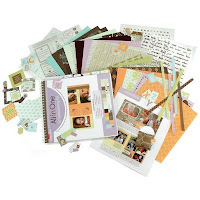 The great thing about these scrapbooking kits is that all of the materials were designed to work together beautifully! Before getting started, you'll need to collect all of the photos you want to include in the album. Consider adding memorabilia from a special event or milestone. Select a coordinating 8x8 scrapbook album that is ready to fill with your completed scrapbook pages. To preserve and safeguard your photos for years to come, choose an archival quality album intended for scrapbooking. There are a few basic tools you'll need to get started, including a scrapbooking trimmer, scissors, adhesive, and journaling pens. A trimmer will ensure clean, straight edges when cutting paper or trimming photos. You'll use your trimmer to create backgrounds, borders, photo frames, journaling blocks, and more. You'll also want to have a pair of precision scissors on hand for cutting curved or circular shapes. Scrapbooking adhesives are used to adhere your photos, decorative papers, vellum quotes, accents, and more to your scrapbook pages. 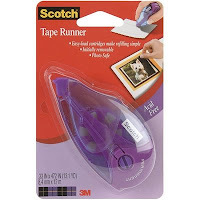 Adhesives are available in a variety of formats, including double-stick tape, tape runner, glue stick, glue dots, photo tabs, and spray-on. You may want to try out a couple different types when getting started to determine your preference. Journaling adds a personal touch to your scrapbook album. Jot down simple phrases or quotes related to your photos on a piece of scratch paper. Select your favorites to add to your pages. When selecting adhesives and journaling pens, remember to always choose archival quality products. Look for labeling to indicate that they are archival safe. Visit the Paper Craft Supplies section of the store to see our selection of basic supplies for getting started. For beginners, instructions are key to getting started with confidence. The Paisley All In One Scrapbooking Kit provides guidance and examples for designing creative page layouts for your album. This kit includes 4 layout sketches with step-by-step instructions for completing 2 versions of each sketch. You can follow the examples exactly for your first few pages and then try creating your own unique variations once you're comfortable with the process. 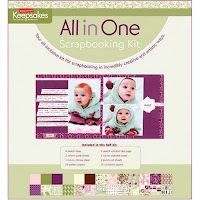 Visit the Scrapbook Kits section of the store to see our complete selection of scrapbook kits. Learning how to create beautiful scrapbook pages is easy with kits that include the materials and instructions to get you started! Explore a variety of beginner craft kits at Weekend Kits and get ready to learn a new craft on your next Weekend at Home!